There are many ways oral health affects overall health. Poor oral health can increase your risk of numerous medical conditions. One issue you need to consider is the connection between oral health and diabetes. 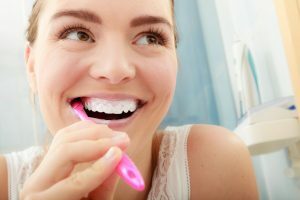 How Are Oral Health And Diabetes Connected? There are actually two connections between diabetes and oral health. First, poor oral health increases your risk of periodontal disease. When inflammation is present in your mouth, it can complicate your diabetes. Your body will not use insulin as well, and your body will have less control over blood sugar. Second, when you are diabetic, you are more likely to develop gum disease. When your blood sugar levels are high, it is easier for infections to grow in your mouth and your gums. This dual relationship between diabetes and oral health make proper oral care essential. Whether you are already diabetic or hope to prevent this condition, appropriate oral care is necessary for your health. You can start by learning about home oral care, and practice it every day. Never fail to brush and floss at least twice each day. A better approach is to care for your teeth and gums after every meal. Use a toothpaste, toothbrush, dental floss, and mouthwash that are recommended by your dentist. Every product should have the American Dental Association’s seal of acceptance on the package. A healthy diet makes a difference. Avoid beverages and foods that can harm your teeth and gums. If your physician has advised a special diet, follow his advice. While most people are advised to visit the dentist twice per year, you may need more frequent visits if you are diabetic. Regular checkups will help your dentist determine whether you are experiencing any complications. It is not impossible to live a healthy life with diabetes. Your condition does not need to worsen due to inflammation and infections. Good oral care can prevent complications. When you are considering your overall health, you cannot afford to neglect your oral health. The time you take for home oral care and regular dental visits can help you stay healthy.